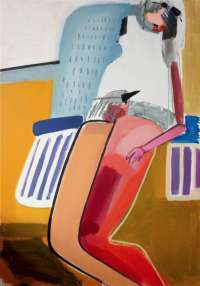 Agata Zychlinska is a young emerging artist who has an MFA from Eugeniusz Geppert Academy of Fine Arts in Wrocław, Poland.The artist is interested in color, form, and shape; although her works are figurative in nature, they are nonetheless abstracted representations of the human form. 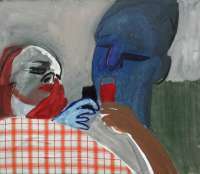 In her paintings, she takes on day-to-day, ordinary subjects. The main topic of Agata’s art is humanity, and everyday things that constantly surround us. She is focused on the home sphere, intimacy, and neighborhoods; her goal is to record the casual in life: trivial situations that are not worth the effort of preserving, such as eating meals, washing your hair, or watching TV. 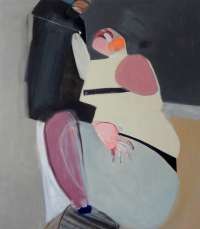 In her works, purposeful deformations of characters show the hidden drama of everyday life. This is her own language through which she comments on reality, but also creates her own narratives. 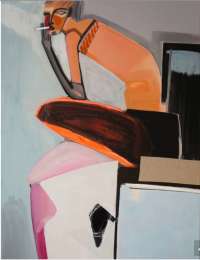 Agata has exhibited in Poland, including at the Gallery of Fine Arts, Gdansk, and Gallery MD S Wroclaw.